Villa Intan is an amazing place. 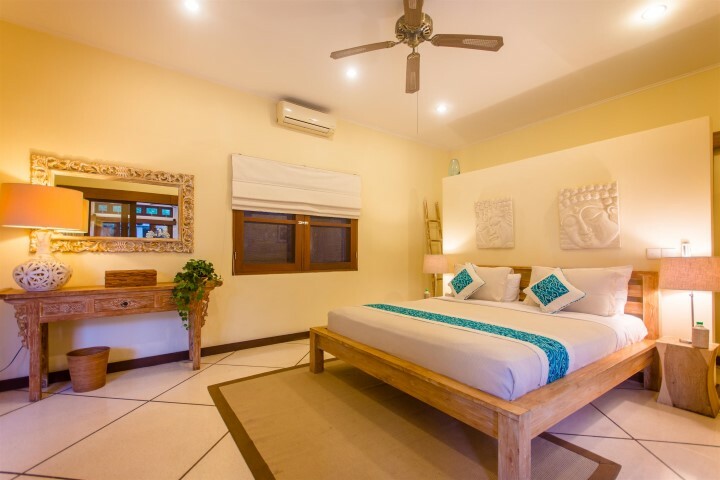 The villa is decorated very nice and has everything you would ask for during your stay in Seminyak: a well equipped kitchen, amazing staff and not to forget the amazing bathrooms which are partly outside. Wow! Villa Intan exceeded all our expectations. Everything was beautifully presented, clean, and meticulously maintained. It was just what our group of overworked Mums needed… time out with the Girls in easy relaxed style! 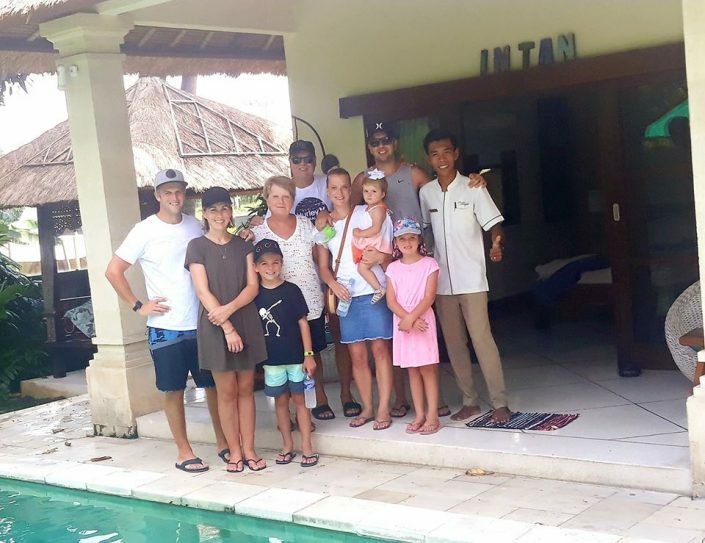 Amazing… that’s probably the best way to describe our stay in Villa Intan in one word. We stayed there for 4 nights and had a lovely stay in this well maintained and warm villa. 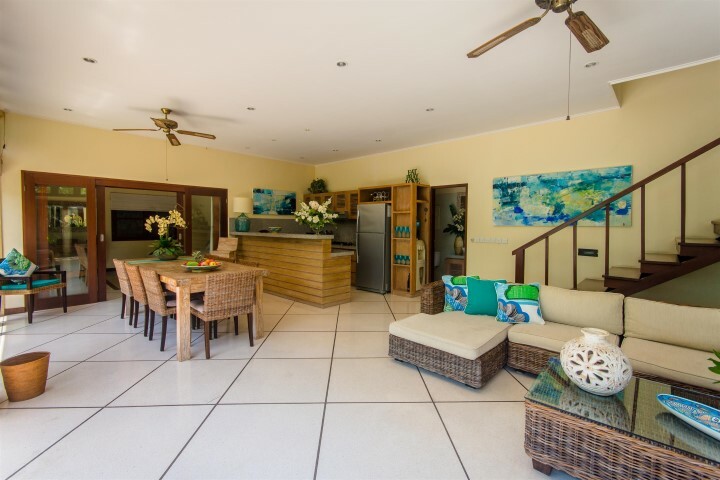 the villa is nicely located near the beach (5 min walk) and is equiped with eveything one could wish for. This was our second stay at Villa Intan part of the Villa Bugis group. Our stay was just like coming home. 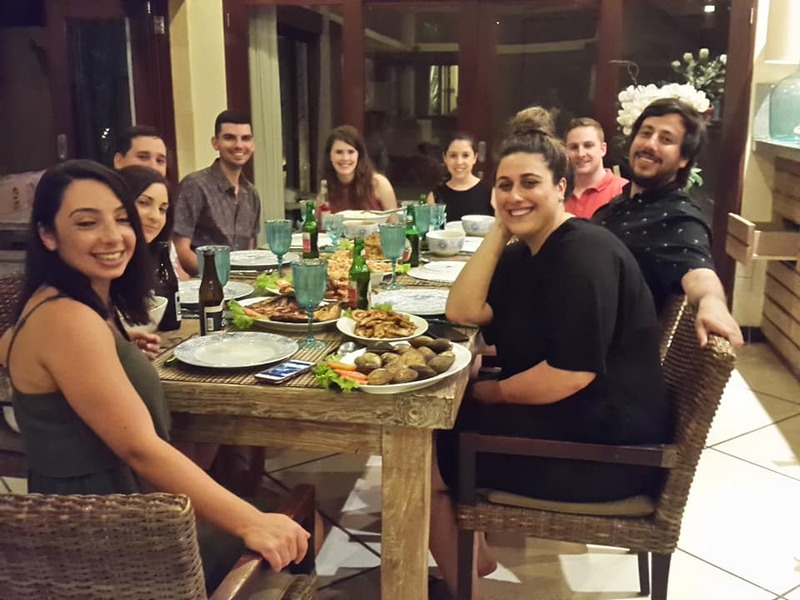 Amazing staff and the villa has everything you could need. 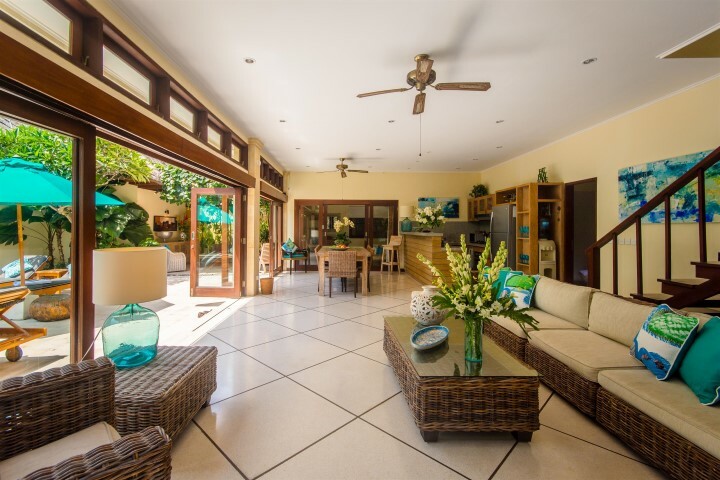 Beautiful large pool and every room of the villa is spacious and beautiful. 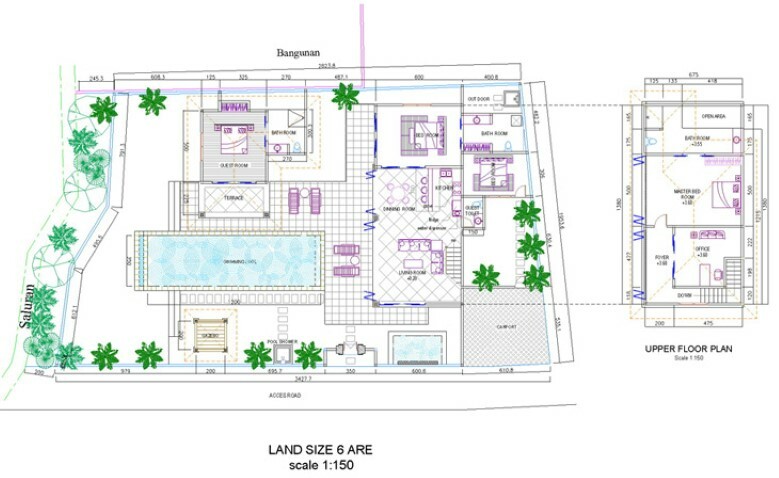 The villa is located at the end of the gang and privacy is assured. Housekeeping is exemplary. 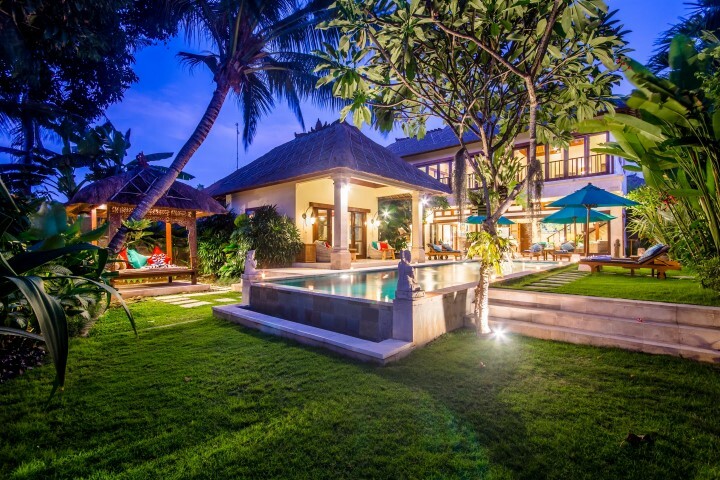 Intan means ‘Diamond’ in Indonesian – and this villa really is a crowning jewel! 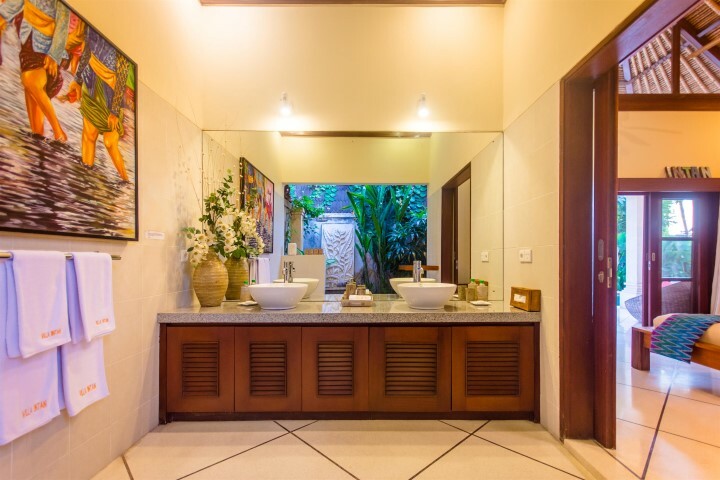 Villa Intan is a gorgeous two storey villa, where everything has been designed to recreate the ambience of a traditional Balinese compound, composed of separate buildings situated around a tropical garden. 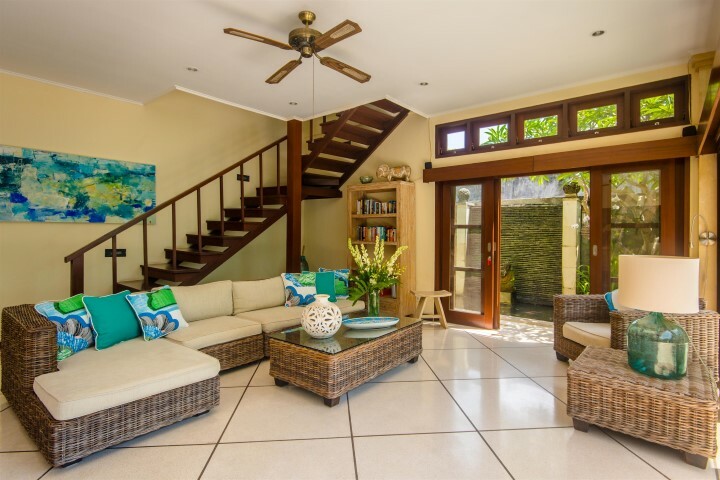 Located in a secluded lane off Jalan Drupadi, Villa Intan is blessed with a fantastic location from which you can easily make the most of your visit to Bali. It’s close to, what’s known locally as ‘Eat Street’ where you’ll find a wide range of cafes, restaurants, shopping, spas and boutiques. Just a few minutes walk away, is Jalan Dhyana Pura – a street rapidly gaining a reputation for its vibrant live music scene, quality restaurants and colourful shops. The beach too, is just a short walking distance from the villa. A short walk along the beach will find you at the famous Ku de Ta, Potato Head, or Gado Gado. 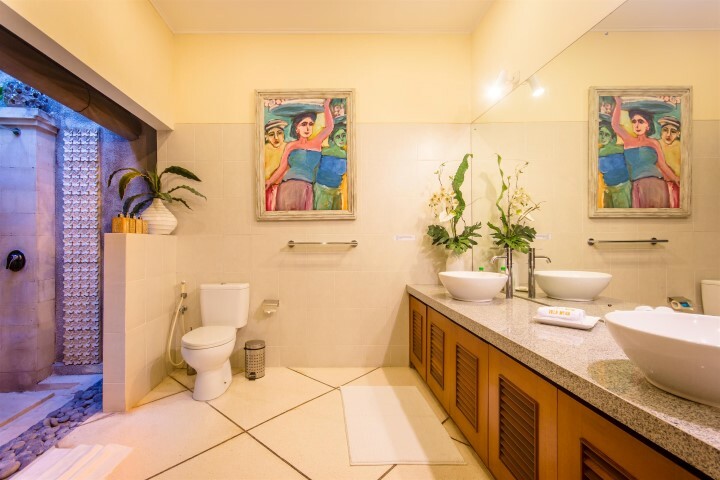 The villas excellent location means that dining, shopping and spa facilities are all available within a radius of one kilometer! 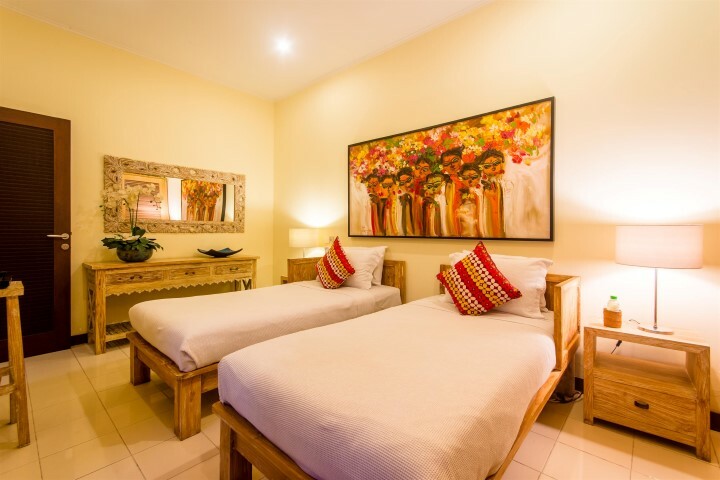 Upstairs, the air-conditioned master bedroom has a king-sized bed, a ceiling fan, a safety deposit box in the wardrobe and a large ensuite with shower, bathtub, and twin washbasins. Adjoining the master bedroom is a TV room which has an LCD TV with access to international channels, a DVD/CD player and speaker system. This room can also be converted into a fifth bedroom with two single beds ideal for a family with young children or teenagers. 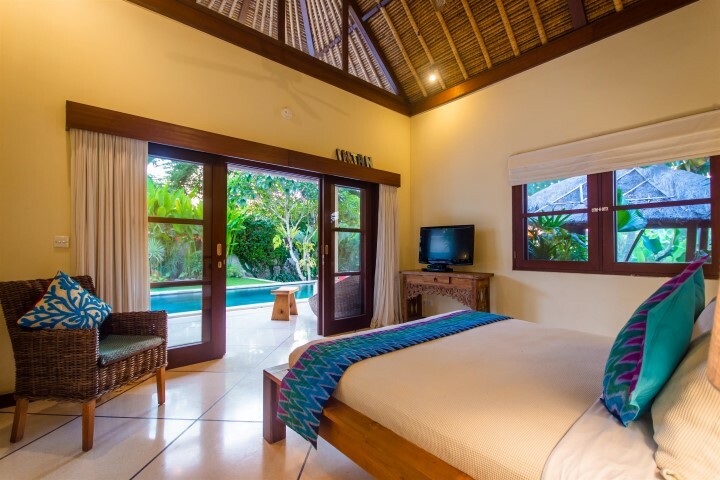 Both rooms over look the garden, pool and rice fields. 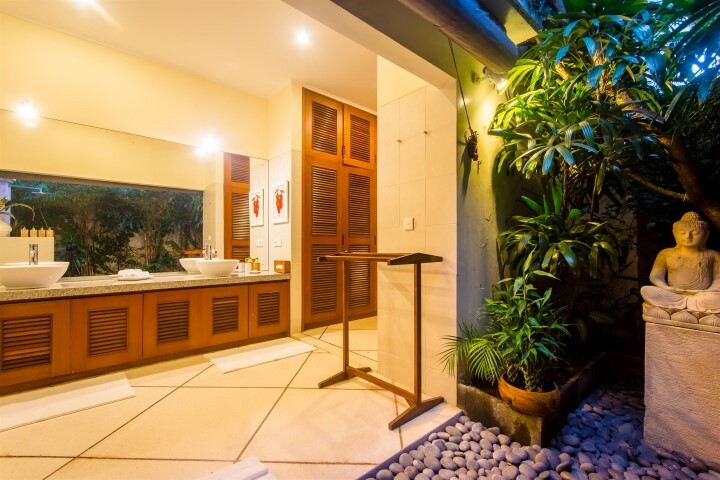 As soon you enter the villa you will find a beautiful fishpond sitting in the corner next to the entrance gate. 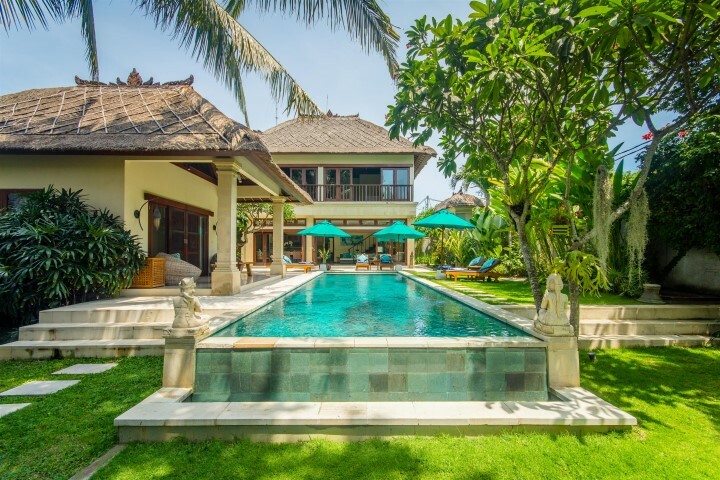 At the heart of Villa Intan is a large and inviting infinity pool, which is surrounded by a tropical garden, rice terrace and mango trees. 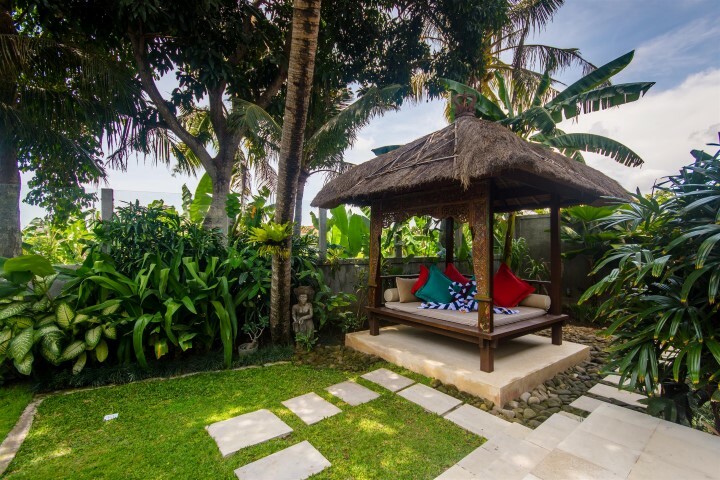 To one side, a gazebo with daybed is a tranquil place to lie and enjoy the serenity of Villa Intan, and outside canopy and lounge “chill” area on the other side. 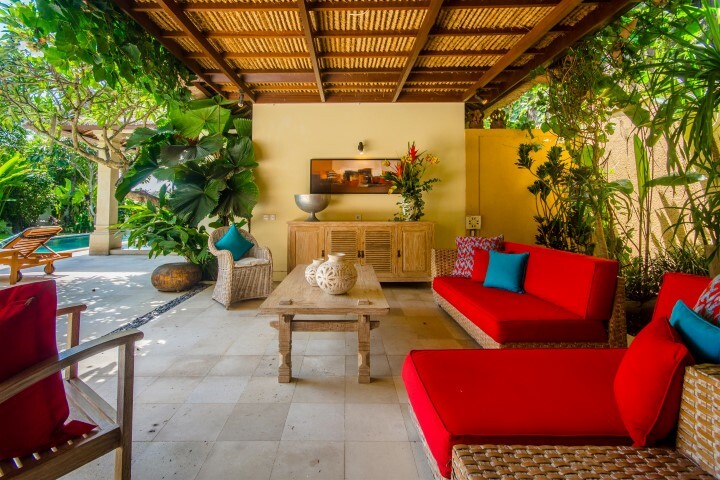 A unique outdoor lounge and entertainment area with a buffet bar allows guest to enjoy their cool beverages. Large rooms with en suites, attentive service by respectful staff and our dedicated staff person who was able to purchase goods e.g. alcohol and deliver it to our villa. 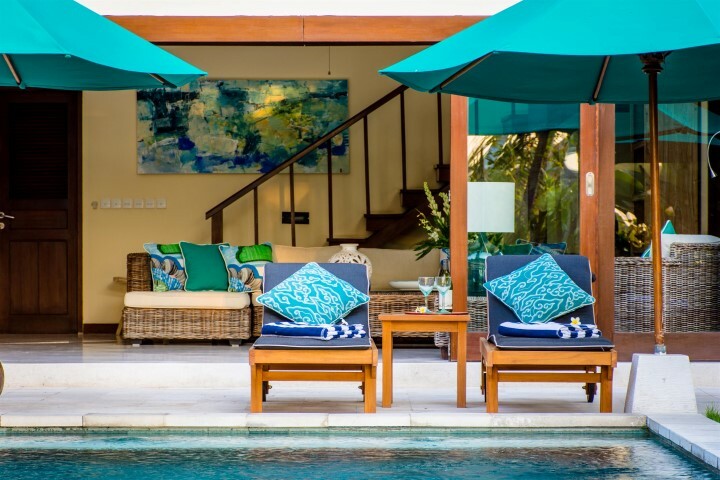 Beautiful pool and outdoor entertaining areas. Close to Eat Street and to other shopping areas. Incredible Villa coupled with lovely staff made for a fantastic family holiday. Yummy breakfasts each morning were a hit with all. Definitely recommend. 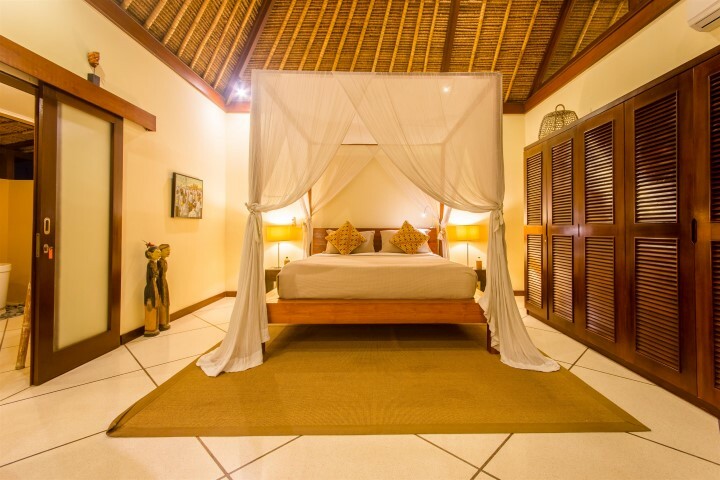 If you are looking for paradise on earth, Villa Intan is the place to be….! 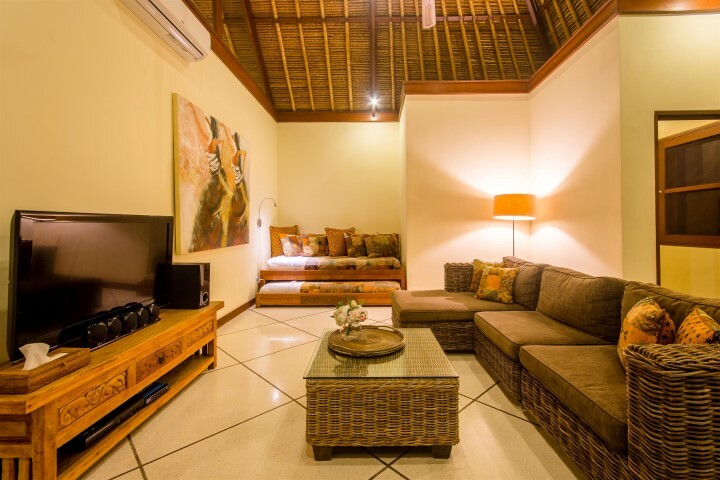 It is conveniently located in the centre of Seminyak (close to the beach, shops, restaurants and entertainment) in a quiet spot that has an amazing view on the rice paddies. 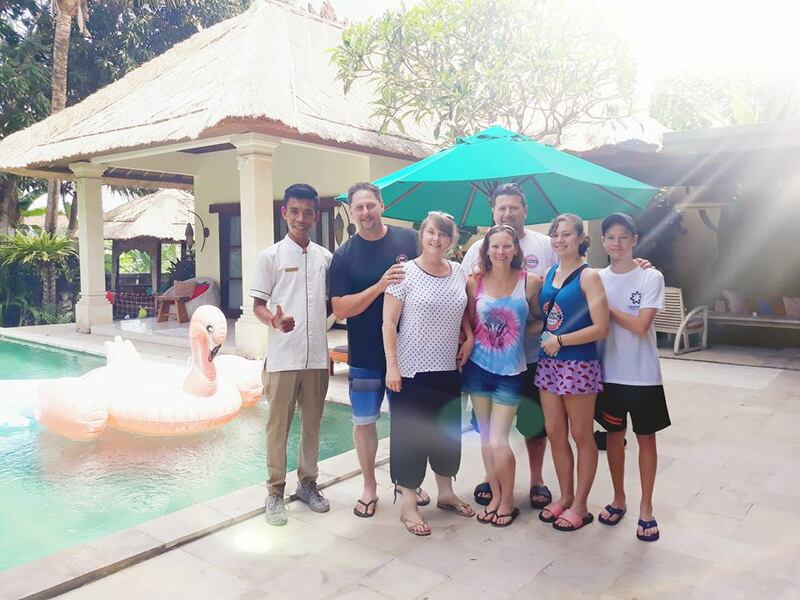 The beautiful decoration and cozy atmosphere made us feel at home from the moment we entered and the incredible staff made our holiday just perfect. We will for sure return to Villa Intan. Highly recommended. 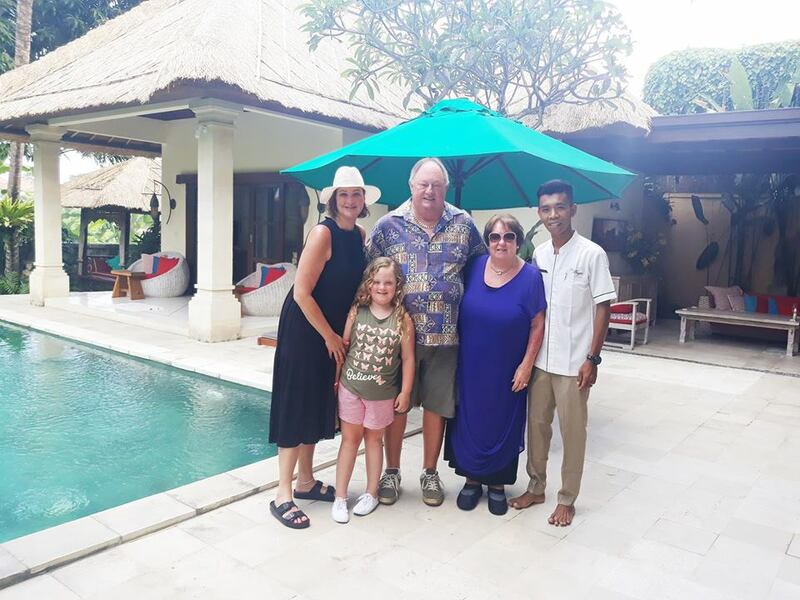 We have just returned from a vacation made in heaven at Villa Intan ! 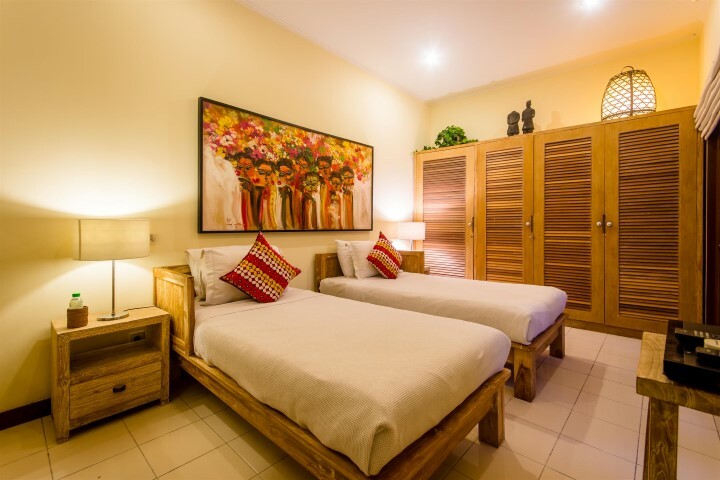 We truly couldn’t have expected a more gorgeous and comfortable place to stay in Bali; all the rooms were elegantly furnished and very well equipped ( air-conditioning, bathroom plumbing, kitchen appliances, pool were all working perfectly !). 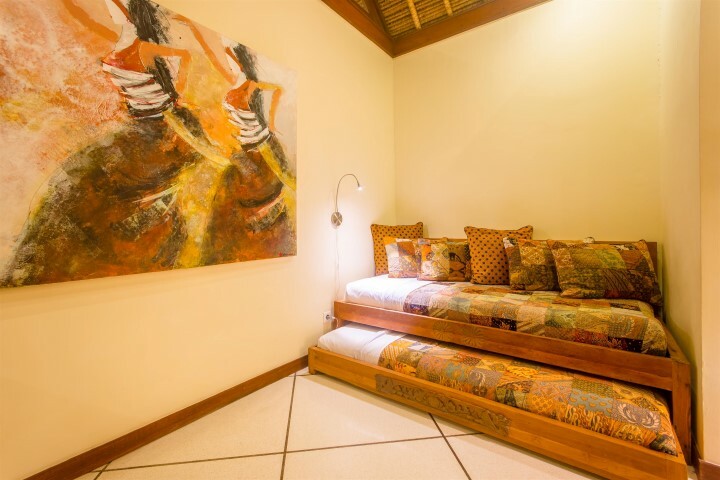 Whether from the top bedroom overlooking the ricefields or the other two bedrooms set around the pool, everything exudes beauty and tranquility (very quiet neighborhood). The staff was the best ! So friendly and accommodating. You could see all they wanted was to please us. What a joy to wake-up every morning greeted by a generous and tasty à la carte breakfast. 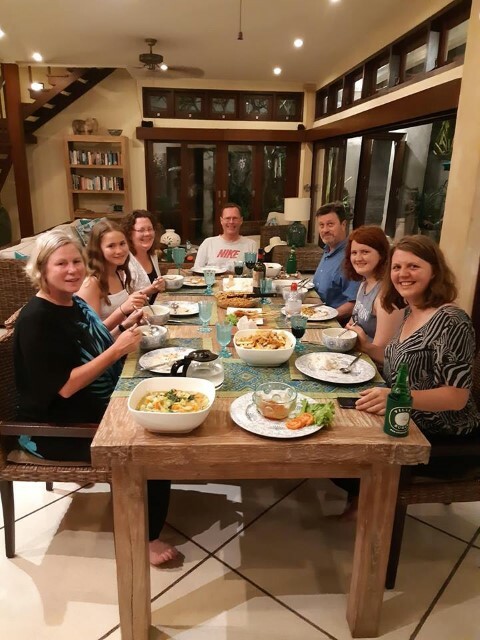 We also ordered 2 dinner meals for our party of 9 and had an exceptional experience of Indonesian cuisine (our family is half Indonesian so we are usually hard to content ! ); 3 cooks came and spent more than 2 hours preparing and serving the delicaciesand cleaned everything after we were finished. Just a quick phone call and all your needs could be met (massage, grocerie-shopping, restaurant take-away…) The house and garden/ pool were diligently cleaned every day, anti-mosquitoe spirals were set all around the house at dawn; it was such a relaxing and precious feeling to come back to such a welcoming atmosphere after a long day at the beach or out exploring the temples. 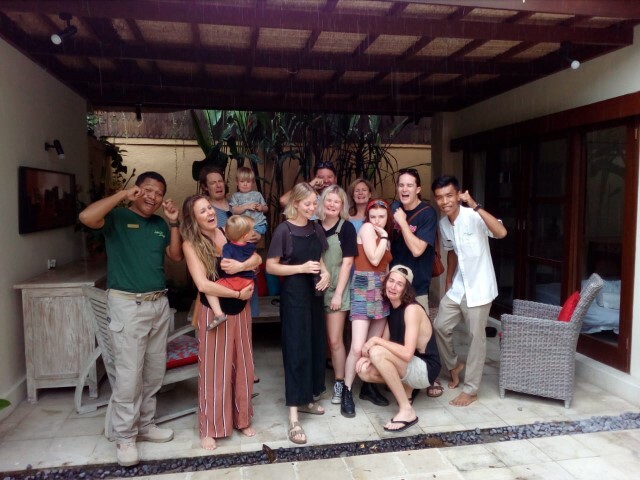 A big thank you again to all the staff at Villa Intan ! 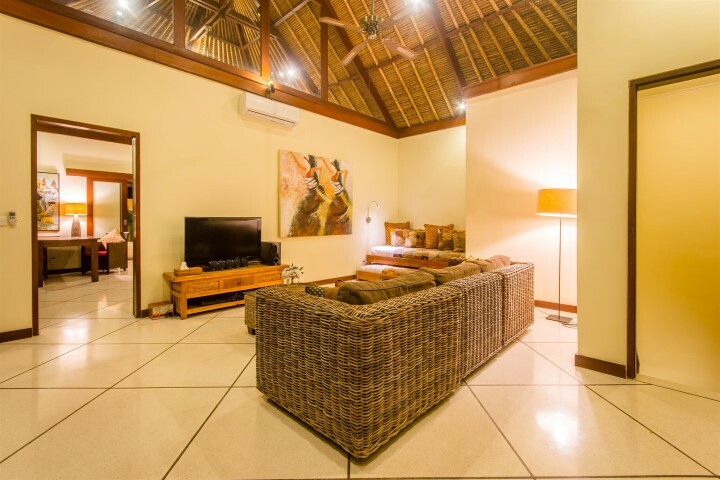 We stayed in Villa Intan for a week and the whole house is absolutely amazing. 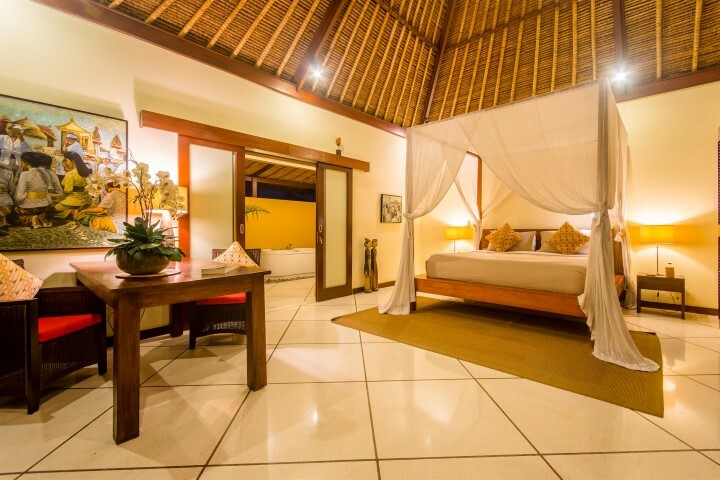 With beautiful rooms and a stunning pool, I would recommend Villa Intan to anyone who wanted a relaxing week in the sun. 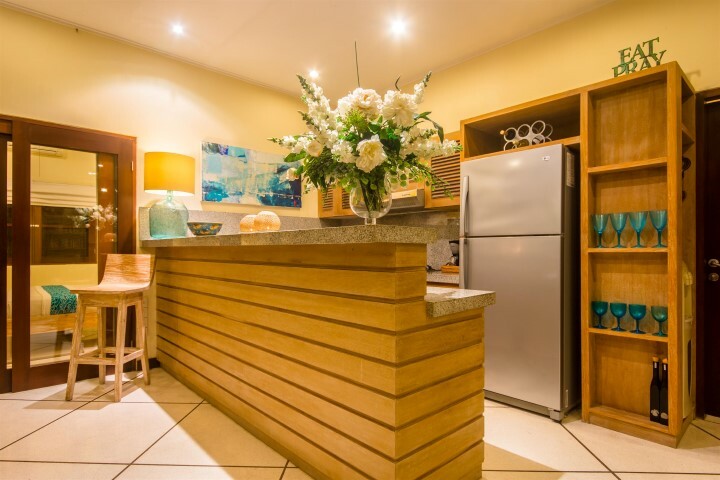 The Villa is close to the beach and a close walk to bars and cafe’s. With friendly staff and an a beautiful view of the rice paddies behind the villa, I would come back in a heartbeat. Had an amazing week in Villa Intan with an awesome group of friends. 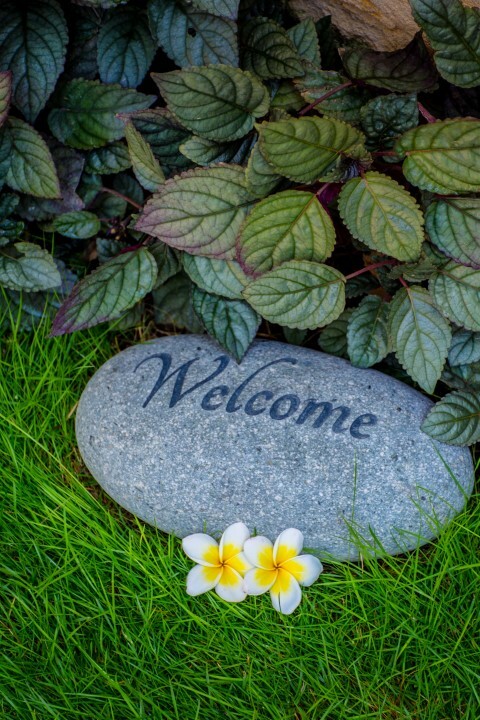 The staff here went above and beyond to make our stay as comfortable and pleasant as possible. 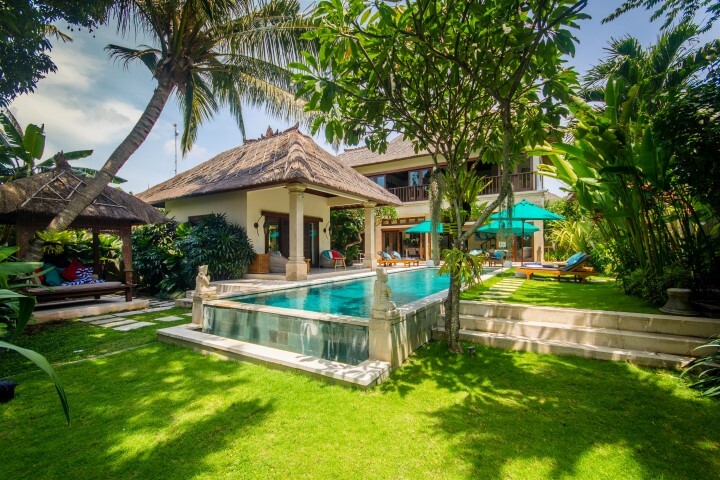 I highly recommend Villa Intan for anyone visiting Seminyak. Thank you very much for a great week! What a week! Villa is unreal, decked out amazingly. The staff are all highly professional, friendly and more than willing to help with any requests. 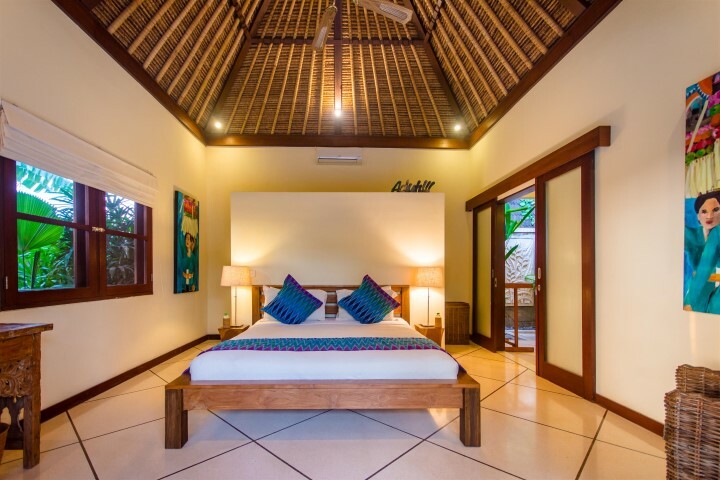 Location is ideal, close to shops, beach etc… Highly recommend a stay at Villa intan! #bali2016 BUGIS!! Villa Intan is an amazing place. 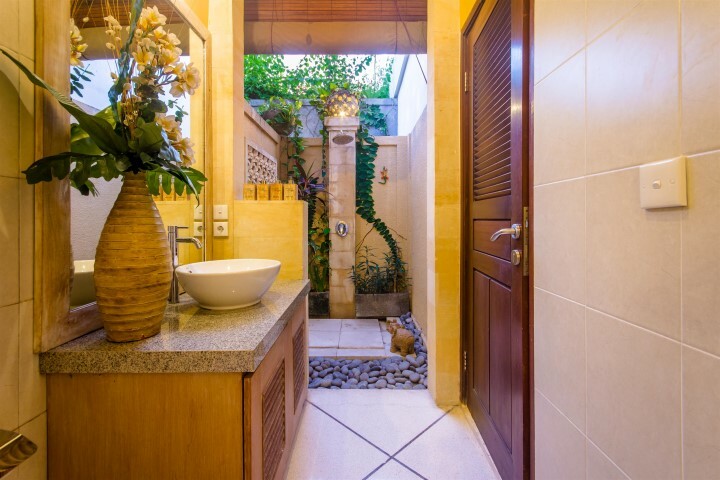 The villa is decorated very nice and has everything you would ask for during your stay in Seminyak: a well equipped kitchen, amazing staff and not to forget the amazing bathrooms which are partly outside. 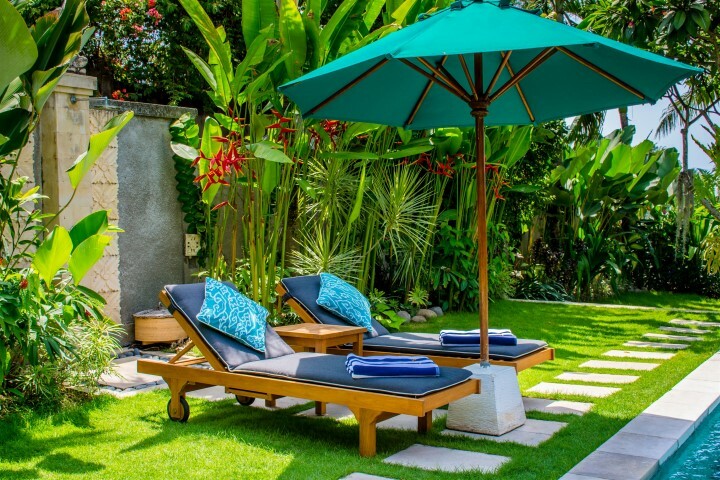 It’s location is unique, with just a 10 minute walk from the beach, on walking distance from the restaurants in Seminyak and a unique a view on one of the few rice fields left in Seminyak. I wish I could come back very soon and would definitely recommend it to others. ‘debriefs’ and much needed massages after shopping the best Seminyak had to offer. A beautiful place to rest & recoup before heading out for dinner and even more fun. 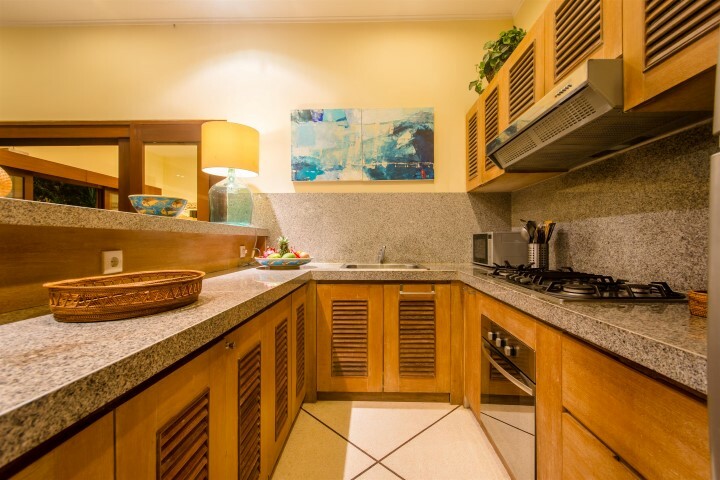 Breakfast was cooked and served every morning at the large dining table – a perfect way to start the day – with the Villa team ensuring nothing was ever left out of place before they left us to enjoy our own little piece of paradise. As an added bonus the wi-fi was excellent. 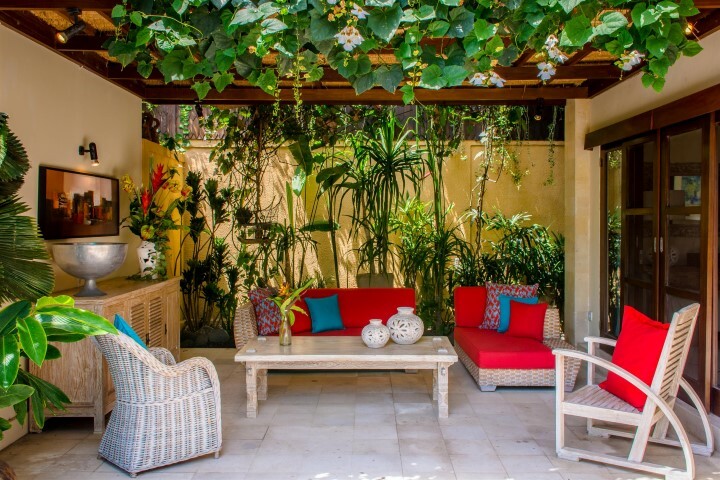 Another thing that hit us was the perfect condition of all the furniture, it seems that the owners keep upgrading their furniture every year, which causes the villa to have a nice and clean look. 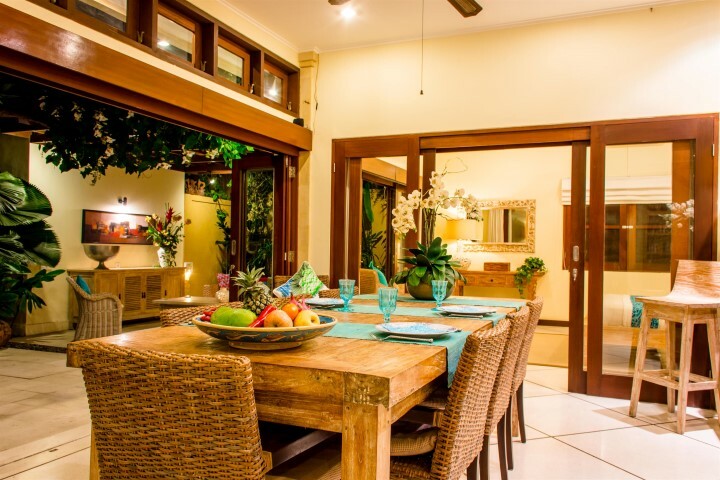 Overall I would most definitely recommend this villa to everyone who is considering staying in Seminyak! All that Seminyak has to offer is a ten minute walk away. Supermarket, shopping, great restaurants and more. 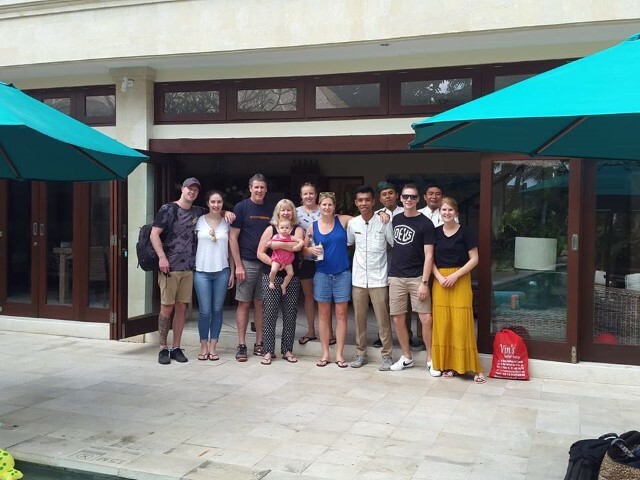 The villa staff as mentioned are fantastic and can cater to your every whim, we had an amazing BBQ prepared by staff one evening as well as an in villa spa day organised by staff. Nothing is too much trouble which makes a truly relaxing vacation. 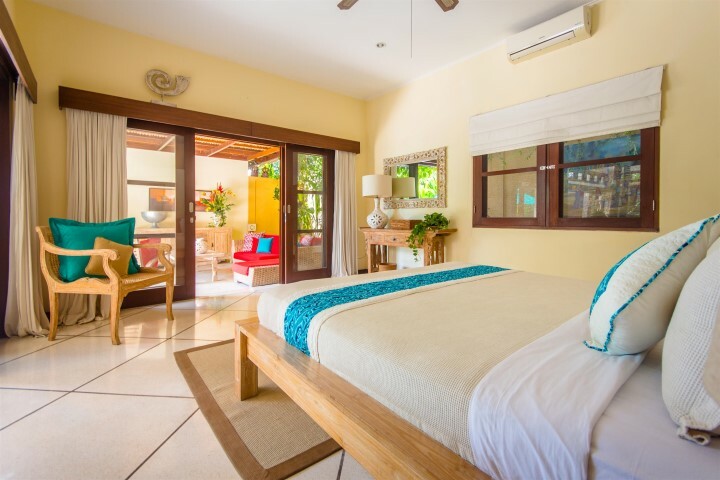 As soon as walked in we loved this villa – then we met the amazing staff and were absolutely floored by how helpful and amazing they are. The pool and bedrooms are brilliant, the location is fantastic as its close the everything but feels like it’s secluded and just for you. Highly recommended for groups (like us) and families. 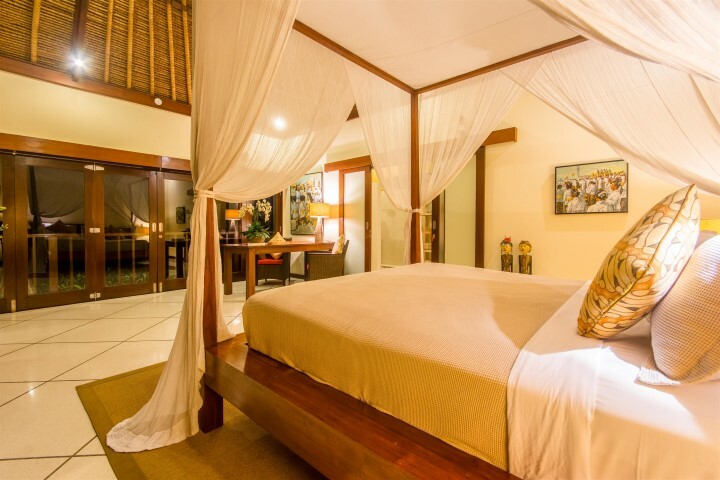 We’ve stayed in villas in Bali before but will definitely return to Intan – five stars! We stayed at Villa Intan and loved it immensely. It slept 10 people very comfortably. 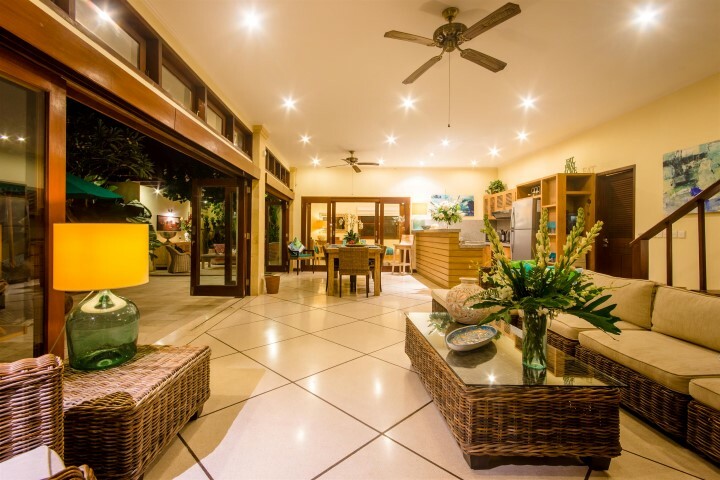 The pool and the garden area is well kept and has a very laid back feeling. It’s quiet and overlooks the rice paddy with no other villas behind it. So peaceful and a perfect place to relax with your family and friends. 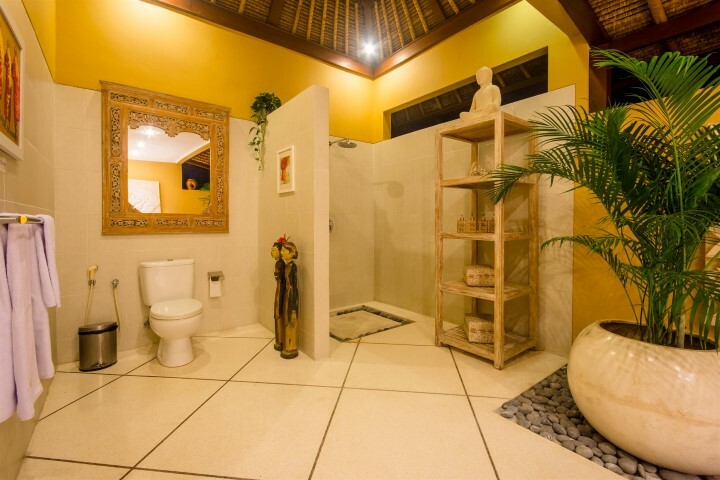 The owners have taken extreme care in keeping everything looking fresh and colorful. 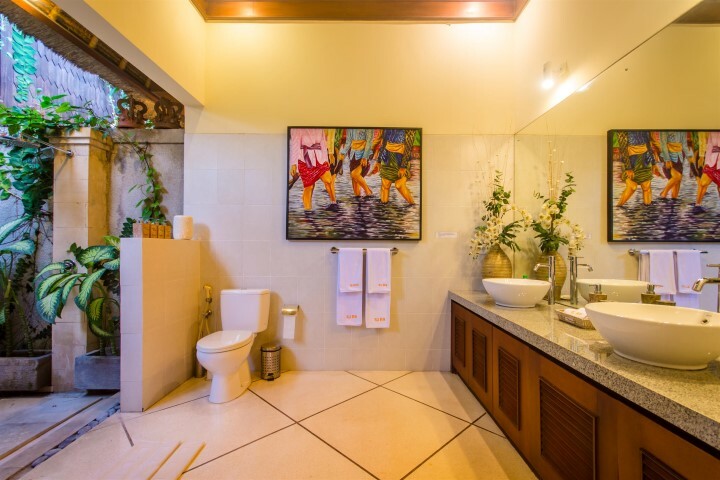 They’ve decorated the Villa with flowers and Balinese paintings. 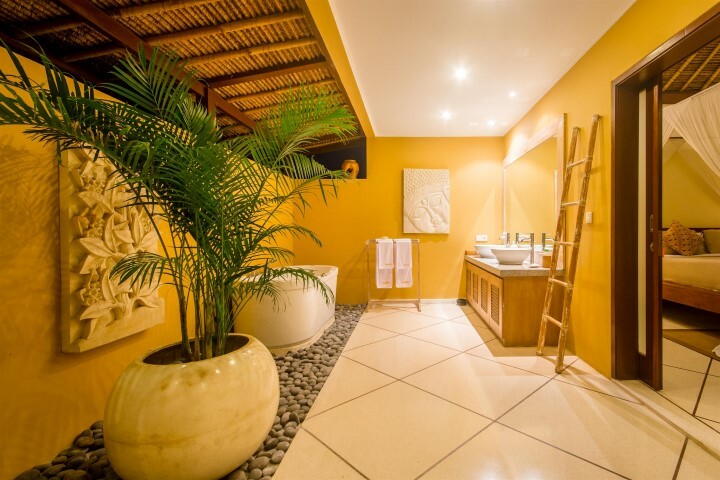 The rooms and bathrooms are tastefully designed and the staff keeps the place looking beautiful. Whenever we need something , someone was just a phone call away and they always responded immediately. You can walk to the beach in 10 minutes. There are so many restaurants and shops within walking distance. Taxis are easy to find off the main road. You can order room service if you deice to eat in. We loved it here and will tell our friends and we will come back without any hesitation. It’s a perfect place for families. Lots of room to move around. Internet and TV work well. It has everything and much more. We’ve lived in Indonesia for 15 years and coming to Bali to find a place like this has been fantastic.